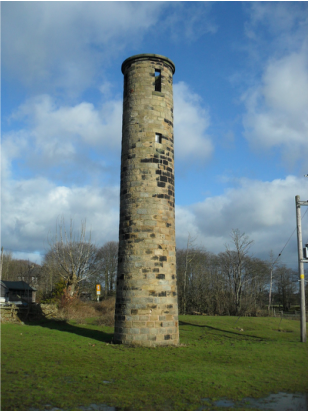 The sighting tower is one of two that were built by James Bray, overseer to the construction of the Bramhope tunnel that was built between 1845 and 1849. In 1840, Thomas Grainger, engineer, built the Gothic north portal to Bramhope Tunnel that was made between 1845 and 1849. It cost £2,150,313 and is over 2 miles long. It is thought that the entrance was made to please landowner William Rhodes who wanted to use one of the towers as a belvedere. The keystone of a bearded man could be a carving of William. It was lived in for a while by railway workers. There is a replica model in Otley churchyard, which is a memorial to the 23 navvies who died while constructing the tunnel.